Hemp Seed Oil is super beneficial for the skin, as it is full of elements that act as food for your skin, leaving it nourished and healthy. When used within skincare products, it can plump tired and dry skin to create a more youthful glow and it can provide long-lasting moisture, which by continually using it can result in an increase in your skin's ability to retain moisture. If you suffer from oily skin, Hemp Seed Oil can balance your skin out as it doesn't clog up pores, and if you suffer from skin irritation, products with hemp in can help to calm and soothe the skin. Finally, it is suitable for all skin types, so it is a pretty nifty ingredient to have in your skin care. 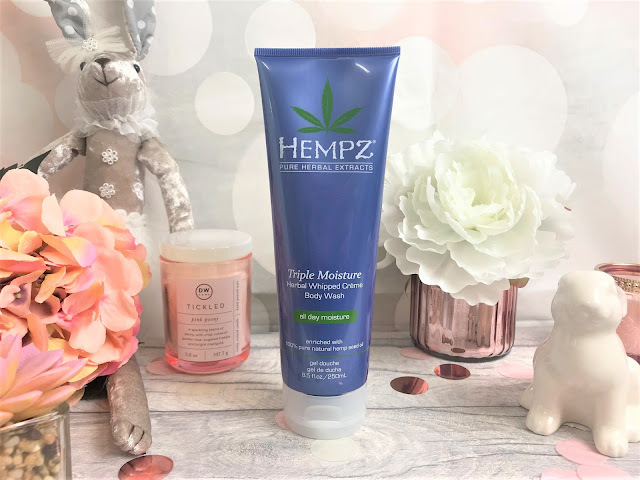 I have recently been trying the Hempz Triple Moisture Herbal Whipped Creme Body Wash, which has been formulated using pure herbal extracts and is perfect for those suffering with dry skin. Rather than a shower gel, this is a thick, creamy body wash, and looks and feels a little like a moisturiser, which is a great sign for dry skin. As well as 100% Pure Natural Hemp Seed Oil, this also includes Yangu Oil which is rich in antioxidants and fatty acids which help to protect the skin and retain firmness and Vitamins A, C and E which protect the skin from natural and environmentally triggered oxidants. This isn't just going to keep you clean and keep you smelling fresh, this Body Wash is going to condition and protect your skin. The Hempz Triple Moisture Herbal Whipped Creme Body Wash costs £10.75 for 250ml and can be found online at Hempz Beauty.